A link to download a PDF copy is below, but we’d like to introduce you to the book first. If you’re familiar with “Sherlock,” please scroll down. Among scholars and the general public, the prevailing consensus holds that millions of European Jews were sent to death in gas chambers as part of an official Nazi policy of mass extermination during the Second World War. So entrenched is this consensus that throughout the Western world those who publicly question its accuracy are now routinely subject to censorship, academic censure, and even criminal prosecution. In contemporary society, no other species of dissident scholarship is met with comparably illiberal reaction. In an intellectual atmosphere poisoned by acrimony and haunted by the specter of persecution, The Gas Chamber of Sherlock Holmes stands as a calm, deftly reasoned, and highly original affirmation of intellectual freedom. 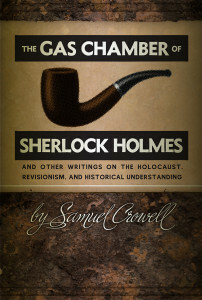 Drawing on extensive empirical and documentary evidence as well as methods of cultural criticism conventionally eschewed by field historians, Samuel Crowell argues that the “canonical” Holocaust gassing claim can be traced to a fateful crisis of modernism — a crisis revealed in popular texts and long-forgotten cultural ephemera. Spanning from the earliest broadcast rumors to the extermination narrative that was sealed at Nuremberg, Crowell’s probing analysis permits us to consider how a grim story emerged and evolved in the cyclonic momentum of an era marked by social upheaval, total war, and unprecedented technological change. If you would like to learn a bit more about the book before diving in, we encourage you to download the original Press Kit, which includes an in-depth interview with Samuel Crowell conducted by Chip Smith of Nine-Banded Books.